The Food and Drug Administration (FDA) is warning that black henna tattoos may cause harmful skin reactions in some people. Henna tattoos are applied to the skin’s surface and usually lasts 2–4 weeks. Typically, henna is a reddish-brown coloring derived from a flowering plant that grows in topical and subtropical regions of Africa and Asia. 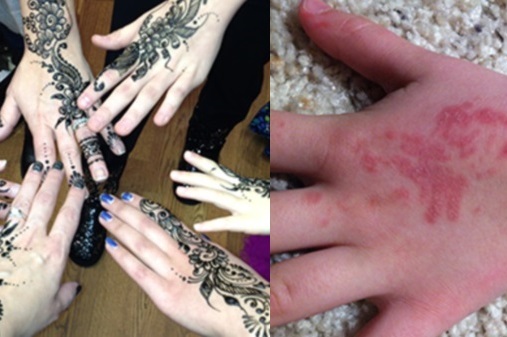 The “black henna” is commonly used in place of traditional henna and may be more harmful. These inks may actually be hair dye or a mix of henna with other ingredients. A coal-tar hair dye containing p-phenylenediamine (PPD) is often used to darken the henna that can potentially cause dangerous reactions in some users. PPD is not legally permitted in cosmetics intended to stain the skin; it can only be used in hair dyes accompanied by a cautionary statement on the label. Cosmetics, including temporary tattoo products, that do not comply with restrictions on color additives are considered adulterated and are illegal in interstate commerce. For more information call (888) 463-6332 visit FDA.gov.